This is a continuation of the topic Chelle has found time to read (#8). This topic was continued by Chelle has found time to read (#10). Welcome to my September thread! It's back to work month for me, so sad! September 21 is the end of the maternity leave that I have successfully milked into 15 months! It will be nice to be around adults and drink coffee, but it's still work! I have no reading goals for this month and just enjoying my last days of freedom. For those that don't know me I am Chelle, 30something wife, mother of two and a police dispatcher. Hubby is an officer and between our two shift work schedules we share in all duties of house and children. I read at work when it is slow and after our daughters are in bed or relaxing. We had our second child in 2017 so life is hectic right now but I'm still trying to find time to read. I used to read about 100-125 books a year but in 2016 I only hit 36 and 2017 I just squeaked in with 75! I was hoping to hit 100 this year but I am so close and it's only half way through the year so I've upped my goal to 150. 🚨nope Fifty Shades of Grey (series)	James, E.L.
Left Behind (series)	LaHaye, Tim / Jenkins, Jerry B. ✅Shack, The	Young, William P.
🔷Swan Song	McCammon, Robert R.
This Present Darkness	Peretti, Frank E.
It's been 30 minutes since your last post so I hope this is safe...Happy new thread, Chelle!! Happy new thread from me, too, Chelle! >6 RebaRelishesReading: That's what I was wondering, Reba - if it was safe to post. Very nice photo of your Cape Breton trip, and I love the Dispatch cartoons. Even better, the countdown ticker answered my question and will continue to answer my question as you get ready go to back to work this month. Happy new thread, Chelle. That *Dispatch* cartoon about what everyone thinks you do, is hilarious! Happy new thread, Chelle and good luck with your return to work. 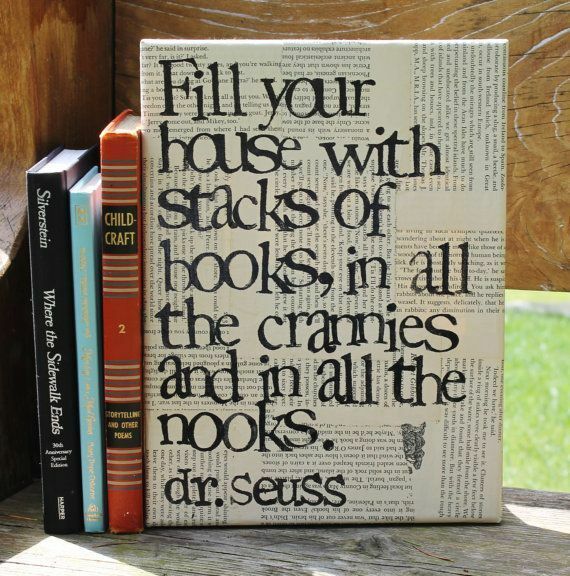 Kids have the effect of cutting down on reading...:) It's fortunate that they make up for it in so many ways. Happy new thread, Chelle! Im finally caught up with your last thread and ready to hear all about Chloe's first days at school. Happy new thread, Chelle! Happy September! I just love your toppers! Cape Breton looks fabulous!! I worked upstairs in Finance in a municipal building. I passed Dispatch every time I walked downstairs and I can certainly attest to the fact Dispatchers must be octopuses with eyes behind their heads and the capacity to know how to do many things, sometimes at the very same time. They keep calm, cool and collected. I'm sure some times/most times your importance is overlooked and goes unrecognized but you do what needs done. I hope others know and appreciate you are their very first responder. Happy Sunday, folks! It's a rainy day here but I'm hoping it clears up after lunch as we have a BBQ to go to! Yesterday was Nate's father's retirement party. He was a police officer for 36 years and retired as a high ranking Inspector. We had a little family party for him, with cake of course. >8 mstrust: Thanks, Jennifer! I'm getting antsy to go back to work. I love the girls and enjoy time home with them but I was not meant to be home all the time. >11 jessibud2: Thanks, Shelley! A friend from highschool messaged me on facebook asking about what I do. She got laid off from the newspaper that she was running and now wants to be a dispatcher. She seems think it will be easy and is going to start applying to local services. 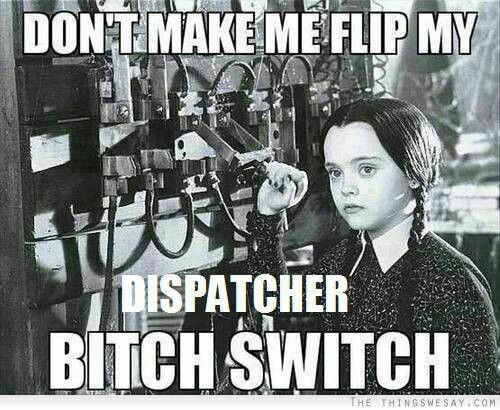 I tried to talk her into taking the dispatch course as it's not easy to get a dispatch job around here without training or experience. I feel she is in for a let down when she goes for the extreme testing and interview. >13 ronincats: Hi Roni! Check back next Thursday for a school photo! She is getting excited for her first day. She picked out a blue dress with little pink unicorns for her first day. >15 Carmenere: Thanks for that, Lynda! 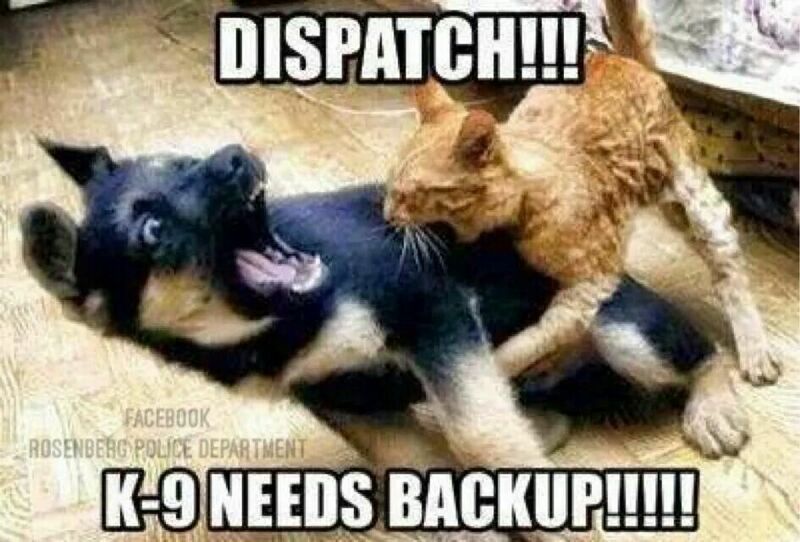 I think sometimes people, wrongly, assume that dispatchers are just answering phones like any call centre does but it can get pretty crazy and stressful in there. There have been calls that come home with me and stay in my mind for a long time and there are some that I will remember forever. Most days are pretty routine though, thankfully, and since I'll be working straight days I may avoid some of that as a lot of the crazy stuff tends to happen at night. >16 ChelleBearss: Oh dear, if you're at the other side of the system that is going through here I'm afraid you won't be having a BBQ today. It's POURING outside!! I've thought about reading the Harry Potter series. I even bought the first three years ago but then I loaned them to Daughter2 who loaned them to a boy friend and then broke up with him...bye-bye books. Now the series is so long it seems daunting but I also feel like I'm really missing something so will probably read it some day. Are there any others you would recommend I add to this list? >19 RebaRelishesReading: It was pouring here for about an hour when we woke up. It's sunny now and doesn't seem like rain is in the forecast for the afternoon, thankfully! >20 RebaRelishesReading: Those are some great ones! I also have One Hundred Years of Solitude on my list and have it out from the library for this month. I absolutely recommend the Harry Potter books! Like 1000 percent recommend! It poured most of the morning here but has been dry, and often sunny, since. Hope the barbecue went well and stayed dry. Hi Chelle, happy new thread dear friend. Happy new thread, dear Chelle. I'm impressed that you finished the PopSugar Challenge. I'm still tracking it but I don't actually expect to complete it this year. I overcommitted.... big surprise. Ha. Your progress on the 100 is great, too. Sorry you have to go back to work this month but I'm glad you had a good 15 months for parental leave. It has been a good time, yes? >21 ChelleBearss: I won't get to it this month but I have One Hundred Years of Solitude on the shelves and I really want to read it. Oh, and I'm a huge fan of A Prayer for Owen Meany!!! Happy new thread, Chelle. I see the Great American Read is coming back to TV soon, I will be interested in seeing how this all works out. Back to work already!! Enjoy your last weeks of freedom. Happy new thread, Chelle! 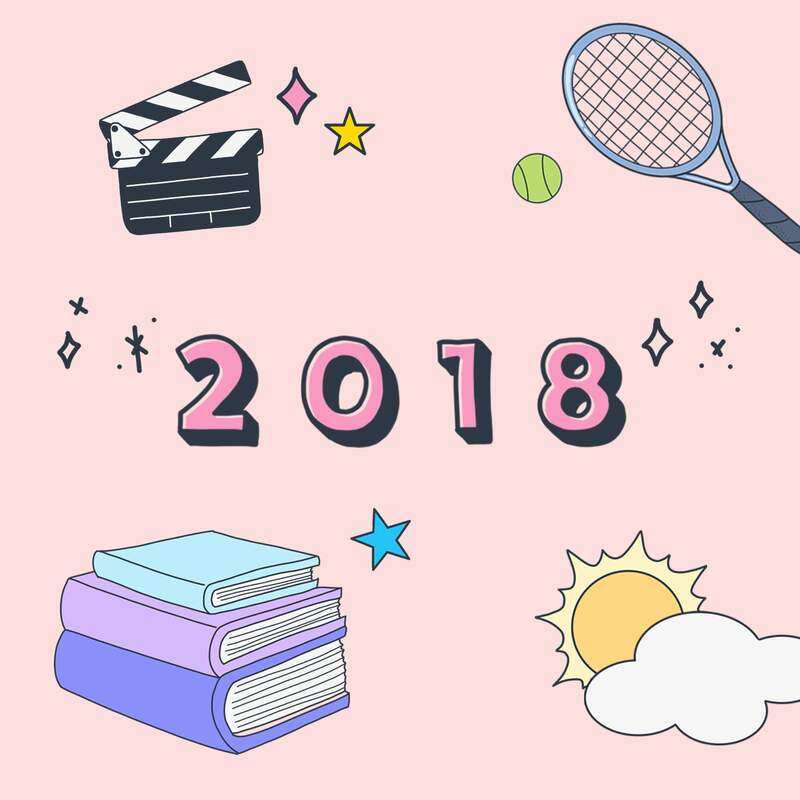 You are killing the books this year. : ) Congrats on nailing the Pop Sugar Challange! (I just thought I'd say that again.) Enjoy your last few weeks of freedom, although you will probably enjoy heading off to work again, too. Happy new thread, Chelle! I loved the holiday photos on your last thread, too. I'm glad Chloe is looking forward to school, and her dress sounds super-cute! Happy New Thread, Chelle. Love that topper. Hope you had a nice weekend and got some reading in. 'Morning, Chelle, and happy Tuesday to you. Morning, folks! Yesterday we went to the OPP family day here in town and got to see some of our coworkers and friends. Chloe found a friend she hadn't seen in about two years and they become instant buddies and were inseparable for the morning. There were displays and demonstrations by all our local emergency services and support groups as well as military and natural resources. Chloe and her friend got to spray a fire hose and that was the highlight of their day, as well as seeing a helicopter land. >22 RebaRelishesReading: I hope that you do! The first is a little younger seeming but they grow as he grew and I think everyone should read them! >23 johnsimpson: >24 PaulCranswick: Thanks, John & Paul! >25 EBT1002: HI Ellen! I hope you will continue and try and finish pop sugar but I totally understand over committing! I can't commit to anything right now and am lucky that I finished it earlier in the year or I might not have finished. >31 msf59: Thanks, Mark! We did have a great weekend and enjoyed Nate's vacation time! Your family day sounds like a lot of fun and how nice you got to reconnect a bit before going back to work. I am really enjoying these stories although the repetition of information from the previous books is a bit too much, as well as too much educational information about the land, time and animals. The story gets bogged down at times with just too much extras, but the story itself is still wonderful and captivating. If I didn't love the story and characters so much the extras would ruin it and possibly cause me not to continue, but thankfully I am addicted now and need to finish the series. I remember getting weary with the extras in that Clan of the Cave Bear series, too. Some editing would've worked wonders. >38 jnwelch: Thanks, Joe! Weary is a good word for that! I find myself skipping forward pages when it's too bogged down with info. What a beautiful photo of Chloe!! Is that her "first day of school outfit"? Hooray for Chloe's first day of school. Another joy of LT, is watching the kids grow up. How special. Enjoy the cooler day and the quiet time, Chelle. Lovely picture, Chelle! And the dress is perfect :-) I hope she has a great first day. >40 ChelleBearss:, Hi Chelle, what a great photo of Chloe ready for school my dear, I can well imagine it was quiet for you. Sending love and hugs to you and the family from both of us dear friend. I hope the first day of school was a happy one for Chloe, Chelle. How did her first day go? I hope she loved it! >41 RebaRelishesReading: Thanks, Reba! It was her first day dress with the little unicorns and peach coloured shorts underneath. >42 msf59: Thanks, Mark! It was a nice day and only hit 24. It's much more comfortable now and we went for a walk with Elissa after we dropped off Chloe. Favourite things: Crafts, tacos, and hide & seek. When she grows up she wants to be a princess. >45 johnsimpson: I wish it had been a quiet day, John, but after lunch I had to take Elissa to her cardiologist appointment. All is well and we don't have to go back until June! >47 scaifea: It went great, Amber. She loved it and is excited to go back. I'm glad that Chloe loved her first day of school. The dress and pink shoes are absolutely adorable. A princess, eh? Well, when I was 5 I wanted to be a Dutch girl. Mine worked out because I married a man of Dutch heritage. I wonder how Chloe will become a princess? I'm also glad to hear that Elissa's cardiologist appointment went well and that you don't have to go back 'til nest June! Late peeking my nose in to your latest thread but it looks everything is carrying on fantastically. Enjoy your last couple of weeks of maternity leave! >48 ChelleBearss:, Hi Chelle, that is good news about Elissa's Cardiology appointment my dear. Hope you are having a good day and hope you and the family have a great weekend as we will going down to Tenby in West Wales, especially as we are calling in to Hay-on-Wye to look and buy books, yay. Sending love and hugs to you and the family from both of us dear friend. Chelle, great news about Chloe and Elissa! Today the girls and I will be heading to visit my parents for the day. It's been too long since we went for a visit and Chloe misses her grand parents. >49 karenmarie: Hi Karen! Chloe has decided she wants to be a princess for Halloween as well so when we were at the mall we let her pick out a crown, wand and necklace to go with her dress (which she was given). >50 drneutron: Yep, Jim, tacos are one of the few things she will eat without fuss! >51 katiekrug: Hi Katie, Tacos and pizza are her favourite foods. >52 MickyFine: Thanks, Micky! It's flying by! >53 johnsimpson: Hope you had a great trip and found lots of books, John! >54 Berly: Thanks, Kim! The biggest thing is to remember to leave early to pick up Chloe! Her school lets out at 330 but the JKs get out about 10 minutes earlier. All the parents get to stand around the front doors and wait until the teachers release their kids one at a time. As you can imagine it's gossip central for the ones who know each other. This one was pretty hilarious. I found Abby to be a little annoying in the second book but in this one I adored her. It was a great mix of funny, snarky, sarcastic and vampirey. I hope Chloe is still enjoying school and that things are going well for you all. Hi, Chelle. I hope you had a nice weekend and a had a good visit with the folks. I hope Chloe continues to enjoy school. I really enjoyed listening to this one. 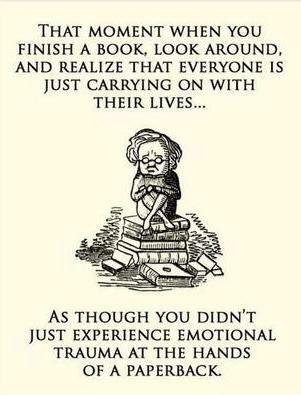 I was surprised at the ending and I love when a book does that to me. YA and not for everyone. I am happy to see the end of this series. I loved, absolutely adored, the first three books but as the series got further along the books stayed way too long and full of repetition and excess educational information. This last book talked heavily about sacred caves and was, in my opinion, pretty boring. There were some decent parts that made me happy to finish but overall it was not an exceptional read. Happy Sunday, folks! It's been a busy week here and I've gotten pretty behind! I'm trying to spend some time this morning to visit as many people as possible. Elissa had her first two days at day care and it went pretty well. She seems happy to play and eat there but wasn't really happy about nap time. I think part of the reason for that was that there was another little boy starting his first two days and he cried from the second he got dropped off until he was picked up. Thankfully he only goes half days so he is gone by lunch. I think 5 hours of constant crying is getting to the baby sitter and Elissa. She also got stung by a bee on Thursday and that was pretty dramatic for the wee girl. She was in her stroller when we walked to school to get Chloe and she was waving her legs around and a couple bees flew around us and one got trapped under her leg. Thankfully she didn't turn out to be allergic! The other reason I haven't been able to be online much is Elissa has suddenly become VERY busy!! She has discovered climbing and if we turn our backs for one moment (like to cook dinner or use the bathroom) she can be found doing something that she shouldn't. We've had to take away Chloe's mini chairs as Elissa uses those as step stools to climb on the table! She figured out that the chairs slide across the wood floors and can be propped up against whatever she wants to climb. We've found her on the coffee table multiple time, trying to pull the baby gate open to go upstairs and have found her trying to climb into the large doll house. It's been a super fun week! When she isn't climbing she is eating dog food or knocking things off tables. We are in extreme baby proofing mode and I don't remember it ever being this bad with Chloe or as tiring. Thankfully Nate is on vacation until Friday and has been able to spell me off on monster child watching. >61 karenmarie: HI Karen! Chloe is loving school. She comes home from school and tells me each day that she made another new friend, although she doesn't know anyone's names! I'm hoping by the end of the year that she knows everyone's name! This week they had two assemblies and one of them was a guy who made sounds (like beat box or animal calls) and she thought it was pretty awesome. They've made pumpkin spice play doh and salt doh to make their name letters. The school has an app that they use to post photos and videos that only parents can see. It's been pretty awesome to see photos and videos of her at school doing art or playing. >62 msf59: Hi Mark! It's been a fun, but too busy, week! Hope your ankle is feeling better! >63 ChelleBearss: Chelle, I felt much the same as you about the final Cave Bear novel. All those caves! Too much. She should have stopped after book 5, I think. >64 ChelleBearss: Oh dear re your little adventurer! My youngest nephew was like that, and it was quite a shock to my brother and SIL after their oldest one, who was much more placid and never challenged the baby-proofing. However, youngest nephew (now 15) has an excellent eye, and is great in sports where co-ordination really counts, so you could have a future Olympian there! >63 ChelleBearss: Glad to see I'm not the only one who found descriptions of caves pretty boring! Way too much of the last novel was dedicated to caves. I admit to skimming quite a bit. 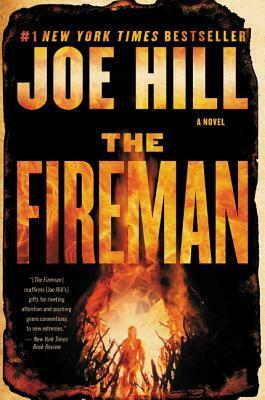 Anyone interested in a group read of The Fireman by Joe Hill next month? Mark and I will be reading it and I will start a group read thread on October 1st for anyone who wants to join in! Should make for a good start to some Halloween reading! It’s on my wishlist, so yeah, I’m in! This was very weird. It can't really be described as horror or sci-fi, but I saw it aptly described as humans vs aliens while on an ADHA acid trip. Entertaining but very odd. This was a page turner for me! I loved the characters and instantly got sucked into the world and didn't want to put it down! Hi Chelle! You're on the final countdown before you start back at work, I know. I'm glad that Elissa's daycare experience has gone well except for nap time and the crying child. I hope that your house is 'extremely' baby proofed! Congrats on the weight loss for both of you. >63 ChelleBearss: I gave up after Jean Auel's second book. >67 ChelleBearss: I read The Fireman soon after it came out. I'll be interested in what other folks think of it. >70 ChelleBearss: Hi Chelle, I heard that the last Clan of the Cave Bear book wasn't all that great so I have never bothered picking it up. I always felt that the author did extensive research which is good, but then felt compelled to include all the facts in her books and ended up giving us an overload of information. I have officially survived my first two days back to work. Yay! :) It's been a couple good days and the girls are adapting to their routines pretty well. >68 drneutron: Awesome, Jim! I've heard that it's great! >69 msf59: Hiya, Mark! I'm going to try and add in a few Stephen King in October. He has a new one coming out at the very end of the month but I'd also like to try and read a few of his short stories that aren't in the collections that I own. >71 drneutron: Did you enjoy the other two? I'm thinking of starting the second on audio sometime soon. >74 The_Hibernator: Did you read the other ones, Rachel? >75 DeltaQueen50: Hi Judy! I wanted to finish the whole series as it bothers me have unfinished business lol. I wouldn't overly recommend it other than to have closure on the series. Yay for a smooth transition back to work! That's great! I'm glad you survived the first two days of work, glad that there have been no major hiccups. >63 ChelleBearss: It wasn't the best of the series, but I enjoyed it. Always good when a series is finished. >64 ChelleBearss: Sorry Elissa got stung, I hope it didn't scare her too much. Glad your whole foods plan is working for both of you and Chloe has a good time at school. >76 ChelleBearss: And you are back to work, glad it went smoothly. Happy Monday, folks! I'm off today and tomorrow and was surprised to find myself completely exhausted this morning. I guess going back to work took a lot more out of me than I originally thought! Today it's just Ellie with me as Nate had court. We are cleaning and hanging out and then grocery shopping soon. >80 scaifea: Thanks, Amber! It will be nice to have that pay cheque again! >82 FAMeulstee: Hope you had a good trip, Anita! I read this on audio and enjoyed it. I was surprised at the ending and totally had guessed it wrong. Couple twists made for an interesting listen. I did find a couple spoilers for her other book, which I didn't realize had the same main character so maybe start with that one if you mind spoilers. This was a quick and fun read. I really enjoy Gail Carriger's paranormal world and I hope that she will add more to this series. Hope everyone is having a good week. It's be super busy here but today I'm at work and it's quiet (for the moment) and I am hoping to get caught up with everyone today! Nate left this morning for Florida for a course, so it will be just us girls this weekend. Morning, Chelle! Have fun with the girls this weekend! Sweet Thursday, Chelle. I hope your return to work, has gone smoothly. How was Force of Nature? I have been curious about her for awhile, just waiting for an LT pal to warble loud enough. When were you planning on starting The Fireman. I was thinking next week. I am also planning on reading The Outsider in October. Wow, lots of changes in your house! Chloe at school, Elissa at daycare, you back at work. Sounds like you're doing okay with all of it? I'm sure you'll have fun with the girls' weekend. It's a PD day here today and we all slept in a bit. Well, not Chloe but she played and let the rest of us sleep a bit extra! >87 mstrust: Thanks, Jennifer! Chloe has gymnastics and a birthday party tomorrow so today we relax. >88 msf59: Hi, Mark! I listened to it on audio book and enjoyed it! I was surprised with the ending, as I had guessed wrong. If you can read her other book first as I didn't realize there were some spoilers. I think I will start The Fireman Monday. I wanted to start Lethal White but I got busy yesterday and didn't get it started. It's pretty big so I will put that aside and start the Fireman very soon. I'll try and make the thread today. >89 jnwelch: Thanks, Joe! Lots of changes but they are going smoothly. Back to work went pretty easy and I'm back in the swing of things without too many hiccups. Group read thread is up! Please join me in reading The Fireman by Joe Hill for October spooky month! Glad your re-entry to work is going well. Just wanted to tell you I bought Harry Potter 1 & 2 yesterday...that’s a start. Just dropping by to wish you a wonderful weekend. Glad you are back in the swing of things at work. Hi Chelle - I'm glad your return to work is going well. And you are still managing to read! Impressive. I have reserved the first Harper. She has been getting a lot of LT love. 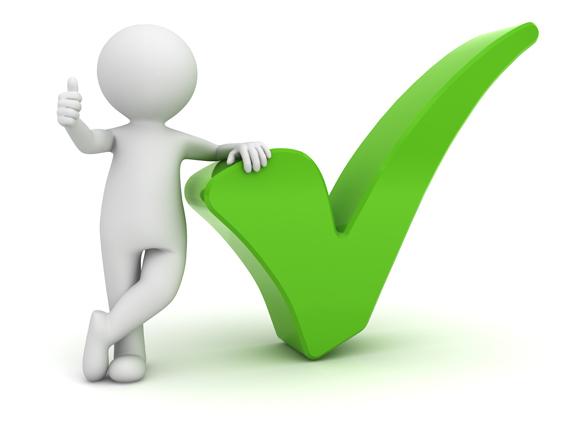 Wishing you a wonderful weekend, Chelle and I am pleased to see that you are doing well back at work. Happy Sunday, Chelle! Very cute pic of Chloe's first day of JK! She's growing up so quickly. I couldn't help but smile at Elissa's athleticism. I know it is hair raising for you and Nate but the picture in my mind of your little sprite pushing the chairs across the floor to her desired location is precious. The Fireman looks hot. Maybe I'll check it out. Happy Sunday, Chelle. Thanks for setting up the Group Read. I plan on starting The Fireman next week. I also posted the Stephen King thread for October, if you are interested in joining us for one of two. Morning, folks! I am at work on this rainy and cold morning and unfortunately this is my block of four shifts. It's going to be a long week! I've been working on my October spooky challenge and I'm part way into The Fireman by Joe Hill. It reminds me a bit of The Stand, which makes sense considering it was written by his father and I'm sure he read it at some point in his life. Not close enough to make me not want to read it though, but it does have some similarities. >92 RebaRelishesReading: Yay Reba! I hope you love them! Even if the first one seems a little juvenile, they grow as Harry grew. >93 figsfromthistle: Thanks, Figs! Happy to be back and I'll be even happier once that first pay cheque comes in! >94 BLBera: Hiya, Beth! One of the good things about my job is when I'm not busy I am allowed to read. Winter is a good reading time at work! >95 PaulCranswick: Thanks, Paul! Hope you've been finding some time to relax with your busy schedule! >97 msf59: Hi Mark! Thanks, I will join you for a King book or two. I just finished his short audio A Good Marriage. It was interesting, but short. This was a short, but interesting, audio. This is the second book that I have read recently with themes of finding out a spouse has committed a horrifying crime. If you were in that same position could you turn them in knowing that everything you worked for and your children's lives would be forever changed. Your children would live in fear of repercussions from computer hackers, or angry family members. In this day of extreme media, social media and lack of privacy your family would never have peace again. Could you turn him/her in or would you let them get away with it and have to live with yourself. I don't think anyone could really know what they would do until they were in that position, even though we all think we would do the right thing. I normally start a new thread for each month but I neglected my thread this month since I came back to work. I will start a new thread for November. I can't believe how fast those kids are growing! Your work days sound busy. I remember coming home from a business trip when our daughter was quite young - perhaps a year old - and my husband had introduced her to TV. Until then it was only VHS tapes I personally chose, so I was a bit miffed. Surprisingly she didn't like Sesame Street, so she mostly watched what we watched (innocuous until after she went to bed). One of my favorite memories of her is dancing to the Jeopardy theme music, clad in just a diaper. >91 ChelleBearss: I probably won't join you for the Joe Hill book, as his writing does not appeal to me. I've always liked horror, but Stephen King always makes me cringe. And I tried half of NOS4A2 by Joe Hill before I realized the relationship and said to myself "this guy writes just like Stephen King." The same things that annoy me about King's writing annoy me about Hill's writing. So, maybe I gave up to fast. But, still...lol. >103 EBT1002: Join us! It was great, I finished yesterday. >105 The_Hibernator: That's too bad that you don't enjoy King or Hill, Rachel. King is my fave! Happy Friday, Chelle. Hooray for a 3 day weekend. Enjoy. Mine comes up next weekend. Double yah!! I am at the third way point in The Fireman. It has been an okay read but I am far from loving it, at this point. Maybe the second half will offer more surprises. Good morning, folks! I'm resting over my coffee while I enjoy a bit of downtime before our busy day starts! Chloe has gymnastics around lunch and then we head to a family Thanksgiving dinner with Nate's family. Poor Nate has to work but I've offered to grab him dinner and pie leftovers for tomorrow. Ellie has cut five teeth in the last three weeks and has been a little monster. She had a fever and was miserable yesterday but it appears to have broken, thankfully. We've been having a bit of issue with poor Chloe and a little boy in her class. It appears that she has a little bully that likes to pick on girls. He is very handsy and a little nasty sometimes and has smacked her and kicked her, but mostly he uses his words and is mean. We've been dealing with the teachers and they assure us that they are working hard with his parents to change his behaviour. Chloe was upset before school three days this week and didn't want us to leave. Thankfully one of her teachers also does yard duty most mornings and would let her stand with her and talk before going inside. I've been chatting with a couple mom friends that I have made (Yay for mom friends!) and it appears that Chloe isn't the only one that he is nasty too and Chloe isn't getting the worst either. Yesterday he stomped on one little girl's finger and she came home from school with bruising under finger nail. We are trying to talk to Chloe about this and trying to help her work through it, but of course Nate and I have different thoughts on how to deal with it. We are hoping that this child knocks it off soon before I have to start talking to the principal, instead of just his teachers. >107 msf59: Sorry to see you aren't loving The Fireman yet, Mark. Have you met the fireman yet? I finished it a couple days ago but haven't posted a review as I know a bunch are reading it still. >108 figsfromthistle: Happy Thanksgiving, Figs! Hope you have pie in your future! >109 ChelleBearss: - Yikes, Chelle. If this kid's behaviour isn't stemmed and redirected now, at this young age, he will grow up to be someone we see on the nightly news, before we know it. Or worse. I don't even want to know what his parents are like. When I was still teaching, I dealt with parents like that from time to time and I can tell you, it isn't easy. Or pleasant. Good luck. It's still early days but if the situation doesn't improve maybe you can ask that she not be placed in the same class as him next year. It isn't fair to disrupt her year now, especially this early, if she likes school, but you can certainly make that request (and tell the admin the reason!) for next year. >109 ChelleBearss: Jenna was bitten several times in daycare by an obnoxious boy. When I complained the daycare owner said that Jenna would probably bite someone sometime in the future, but I said we weren't talking about Jenna biting but were talking about this boy biting MY child. I told her to keep that child away from my child if she couldn't control him. I don't know exactly what they did, but there was no more biting. Then Jenna was bullied at school, but she was 11 at the time. I alerted the guidance counselor and told Jenna that she should talk with the guidance counselor. They came up with a very effective plan for how Jenna was supposed to respond to the girl and the bullying stopped within a week or two. I realize Chloe's much younger. I personally wouldn't give the teachers much more time to work with him before bringing the principal in. It is absolutely unacceptable that he's hurting your child. I really enjoyed this, although I wouldn't say it's great writing or even very unique. I found a lot of similarities to The Stand, which I guess if you are going to follow a standard for a post apocalypse story The Stand is a great one to take from. Even though it's rather huge I found it to be a quick read and I really loved some of the characters. Unfortunately I predicted the ending pretty exactly, which I was a little disappointed about. Overall I recommend it if you like post apocalypse books, but don't expect spectacular writing and just enjoy the story for what it is. >110 jessibud2: He is in SK and Chloe's class is a SK/JK split. I am hoping that they won't be together next year as he will be in grade one. Apparently he was way worse last year and has been improving. From what I understand from one of the other mom's is his parents are actually pretty decent people from our neighbourhood and they are actively working with the school to correct this. I was shocked at the amount of responses from friends with kids around the same age that are dealing with the same things. I know kids can be snotty sometimes but I was shocked at how nasty they can be, and how often these things are happening! At age 4 and 5!! Sorry to hear Chloe has been having hard times at school. It sounds like she has made some good friends too though. Hope the school is able to help sort the situation out. Oh dear! Poor Chloe and poor you. I certainly hope (for everyone oncluding the boy) that this gets under control soon. I seem to have gone MIA again without fully meaning too. Last weekend my mom was rushed to hospital as her breathing was labored and she was having trouble with her heart. After a couple days in hospital it was determined that she doesn't have bronchitis and extreme anxiety, like we have thought off and on for years, she actually has COPD and is now at home resting on oxygen. She is feeling much better and learning to deal with a different kind of life with oxygen tubes. She had been wasting away, down to 78lbs, and we have been struggling to get her doctor to do more tests as he hasn't been much help. Going to the hospital was the best thing she could have done as her doctor has been missing COPD diagnosis for two years where as the ER resident knew it right away when he talked to her about her symptoms. I finished two books this week too! This one took me 8 days to read, even though I loved it. It was quite long but very well written. I had suspicions all along of what was going on but by the end I realized I had missed a good chunk of the mystery. JK Rowling had written that this was her hardest Comoran Strike novel to write so far and I can understand why! I've become a big fan of Rachel Caine. I've read all of her Great Library series to date, as well as her Stillhouse Lake series and loved them all. This was the first in the Morganville Vampire series and while it is YA I really enjoyed it. I did NOT love the cliff hanger though and like an addict I will rush out and order the next book! >114 charl08: Hi Char! It's very nice to see Chloe making friends and I was surprised when she came home and told me her new best friend is a boy as she has previously disliked all things boys! >115 RebaRelishesReading: Thanks Reba. He didn't bother Chloe this week but unfortunately he is being a pest to other little kids as one of my new mom friends complained that he spit in her daughter's face yesterday. I think she is making a complaint to the school about that as it's gross! >116 The_Hibernator: Ha! It was still a good read even with the similarities. Reading, coffee, and work can be relaxing. Before I retired I always loved to go get a salad and iced tea, bring them back to my desk, and read/eat during my lunch hour. I'm glad to hear that your mother's been properly diagnosed and is doing better on oxygen. It certainly doesn't say much for her primary care physician that he missed the diagnosis for two years, does it? I loved Lethal White, too. I've read two chunksters recently - it and Lisey's Story for the Stephen King October AAC challenge. I devoured both. >119 karenmarie: Yes, he really dropped the ball for her. We've been complaining for two years that she has been declining and he just kept prescribing new anxiety meds. He is in his late 60's and should have retired. My doctor is in the same office as him and my mom will be switching to her for her care now. Unfortunately for the doctor my dad had an appointment with him while my mom was in hospital and my dad had some words with him. My dad is very blunt and probably was a little aggressive in his anger towards the doctor. He did apologize for missing the diagnosis, but that doesn't help her much. Glad to see you've loved the last couple books! What's next on your list? I'm sticking with my spooky/horror/beastie type theme for Halloween and starting a horror Apartment 16 by Adam Nevill. I've never heard of him but it was recommended by the owner of my fave little used book store. Hmm. Next on my list. I just brought Frankenstein off my shelves. I think Mark's reading it. Or just read it. Happy Sunday, Chelle! So sorry to read of the bully at school. It's sad the girls are required to adapt while the boy goes on with his obnoxious behavior. I'm almost finished with The Fireman. Not very impressed but post apocalyptic isn't really my thing. I've got to know how it ends, of course, so I'll carry on. Seems to me it's a homage to the 1980's. Did you get that feeling too? Hi Chelle. Enjoy your weekend. I hope the school bully gets sorted soon. Hi Chelle, I've been having very little LT time for the last week, still getting my hubby settled back at home and then I got caught up with the Kavanaugh hearing but all that did was make me mad! Anyway I am catching up here on LT and I hope you and your family are having an excellent weekend. Happy Sunday, Chelle. I am glad you enjoyed The Fireman. I had mixed feelings about it, but I am glad I can finally tick it off the list. I have been falling behind on my mini-reviews but I hope to catch up. Glad you loved Lethal White. I have that saved on audio. I am at work today and hoping to take a few hours off this afternoon to take the girls to the local pumpkin festival. It's chilly here but I think it would be fun! >121 karenmarie: Hope you love Frankenstein! I adored it and I think I am due for a reread soon! >122 Carmenere: Hi Lynda! I'm not sure if the boys are having trouble with the bully or if it's just girls. I only know a few moms from the class and they have girls. Either way he is a pest and needs to be dealt with soon! I did see a lot of 80's stuff and lots of Mary Poppins! I enjoyed it but I wouldn't rate it as a top read. >124 BLBera: Thanks, Beth! I hope so too! >125 DeltaQueen50: Thanks, Judy! I hope to take the girls out to do some fall stuff today and possibly enjoy a local pumpkin festival. Crossing my fingers that I can sneak out early today! >126 msf59: Happy Sunday, Mark! I did enjoy Lethal White and I'm sure you will too. Long though, but a good read. I love that Chloe is starting to read!! It seems like last week you were worried because she didn't seem interested in learning her alphabet. I hope the little bully is tamed soon. Also glad your mom now has a good diagnosis and is improving. Hi Chelle. Congrats on the early reader!! She comes by it naturally! :-) Go, Chloe! I finally succumbed and turned on my furnace this morning. The thermostat read 18C when I woke up!! I guess it's time! But the sun sure does help. I'm sure your girls will love a pumpkin festival! Have you ever taken them apple picking? There are some great farms we used to take our classes to that cater to this activity for kids and families. Do you know of Chudleigh's? They also have hay rides and play areas. I'm glad your mom was finally diagnosed correctly, and that your dad had the opportunity to tell her doctor how wrong he was. My MIL had a similar experience with a doctor several years ago. She knew something was wrong, he refused to spend time investigating... bottom line, she went to a female doctor and it turned out to be a tumor the size of a softball in her stomach. She sent a photo of it to the doctor that told her she just had gas. Hi Chelle, so glad to see that your mum has been properly diagnosed my dear, it must have been so much of a worry especially with the weight loss as well. I hope that she starts to pick up now that she is on the oxygen for the COPD. Apart from all the trauma with your mum, I hope that you and the family have had a good weekend my dear and hope that the week ahead is good for you all. Sending love and hugs to you all from the pair of us dear friend. P.S. I managed to pick up a nice 1960's fountain pen for the princely sum of just four pounds at the antique fair, luckily Karen didn't say "another fountain pen" when I told her, lol. Happy to hear your mom has been correctly diagnosed AND that she is switching to YOUR doctor, Chelle. As to the behavior issues with 4 and 5 year-olds, these are the years when they have to learn to adjust to a world that is not centered around them and to get more satisfaction and attention for positive behavior than for negative ones. It's not an easy time, for the kids or the parents, if the proper underpinning hasn't been in place. Hope it all works out at Chloe's school. I haven't read the Robert Galbraith books yet. The first one was offered on Netflix as the Daily Deal a few days ago, and I regret not picking it up. It's a chilly fall morning here and all I want to do is take my coffee and cuddle under my covers! I was forced to turn our heat on already (boo, hiss!). Nate is away for a couple days of training so it's just us girls. Today I'm trying to get caught up on bills and cleaning. I'm trying to go through the girl's toys and make a bin for donation and a bag to toss. They have so many toys and things that are either broken, missing pieces or they just don't use. Our toy room looks like Toy R' Us threw up! How are you enjoying HP? >129 karenmarie: Thanks, Karen! I can't wait until the day she can read her bedtime books to me! >131 jessibud2: Hi Shelley! We went apple picking last year and Chloe loved it. Unfortunately we didn't make it to pumpkinfest as I couldn't get off work :( We need to go get our Halloween pumpkins soon! >132 mstrust: That's terrible, Jennifer! I don't know why some doctors can't just trust their patients when they say that they know something is wrong. I'm sure some people think the worst, but we know our bodies and we know when things don't feel right. My mom has found her anxiety is gone now that she is on the oxygen so the ER doc was obviously correct. We took the girls to see her on Monday and she looked sooooo much better! Full of energy and happy and that's something we haven't seen in almost two years. >133 johnsimpson: Hi John! Hope things are well with you! Nice find on the fountain pen! >134 ronincats: Hi Roni! Chloe actually said something nice about her little bully this week. Apparently they sat at the same table and he helped her do some cutting and pasting of letters. She said "he was a good boy today" lol. When I talked to the teacher at drop off yesterday she laughed at that and said he really is a sweet boy sometimes but just acts out sometimes. I am hoping that whatever they are doing works and he becomes nice always and stops being a pest! >135 The_Hibernator: HI Rachel! Hope you can grab one sometimes as I have really enjoyed the series. Morning, Chelle. Enjoy your snuggle time with the girls and the books. It is supposed get below the freezing line tonight. WTH? I am starting the audio of The Outsider, in just a little while. Hi Chelle -- sounds like you're having the same weather we are here at Chautauqua. It's like 7 or 8 celsius today. I'm loving it -- sitting by the fire place, eating soup and drinking tea. Definitely my kind of weather! I finished HP yesterday and loved it. I bought the second one too but I'm going to space them out I think. I couldn't get into this at all. Two story lines and one was interesting but the other was too far fetched. Abandoned 200 pages in, which breaks my heart that I wasted that much time with it. >139 RebaRelishesReading: Hi Reba! I wish we had a fire place, or a hot tub, for those chilly days! Glad to see you loved HP!! Good for you for restraining yourself, good luck with that once you get into the heavier books. They become addicting! Just working on catching up around here, Chelle. Glad to see life is going pretty well. >142 MickyFine: Hi Micky! Hope married life is treating you well! I hope that your just terribly busy with RL and that things are going well for you. Morning, Chelle. Happy Sunday. I am glad Broken Monsters worked for you. I did not click with me, for some reason, but I did love The Shining Girls. I’ve been in that ‘phone game funk’ and that’s when I started listening to audiobooks. It gives me lisence to feel less guilty about zoning out on Candy Crush. >147 ChelleBearss: Sorry to hear about the book funk. A friend recently introduced me to the phone game called "7 Words." It's a bit addicting. And I get frustrated with myself when I blow a half hour (or more) playing it when I could have been reading. I seem to have a bias against JK Rowling/Robert Galbraith. One of these days I might give the Comoran Strike series a try. >148 msf59: Hiya, Mark! I haven't read anything else by Beukes but I will look into The Shining Girls! >149 raidergirl3: Hi Raidergirl! I downloaded a fish game for my daughter on our ipad and became addicted to it myself. It's like candy crush kind of, but you use your points to maintain your fish tank. It's ridiculous to even admit that I love it as it's a kids game! We were doing well with Chloe's reading until she got sick, and now she is so tired that she has no interest in trying to sound out small words. We have been having lots of cuddles with me reading to her, though. I may have overbought books for her for Christmas though! (I never thought I'd say that!!) I bought books some Costco, then saw more I wanted on Amazon, and then her scholastic book fair arrived and I bought a ton more. Whoops.